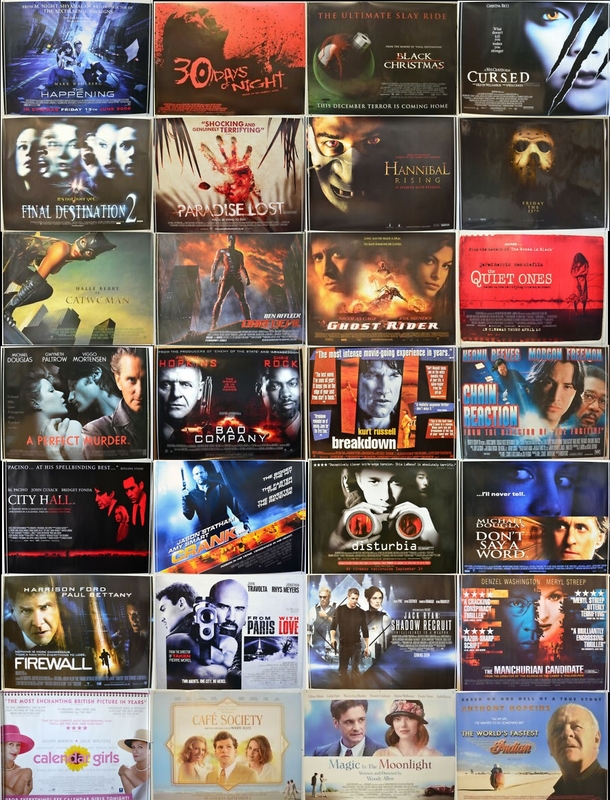 This week I have over 90 Original Quad Movie Posters up for auction on eBay, mostly from the late 1990's and early 2000's, Including Sci-Fi Titles such as the 1997 Special Edition release posters for both STAR WARS : THE EMPIRE STRIKES BACK and RETURN OF THE JEDI , along with COMMUNION from 1990 starring Christopher Walken and Lindsay Crouse, plus HULK, X-MEN 2 (release and teaser), VIRTUOSITY and M. Night Shyamalan's SIGNS. Also listed are a few Horror's including 28 DAYS LATER, WOLF CREEK, THE RING, and a Printers Proof for BRAM STOKER'S DRACULA starring Gary Oldman. 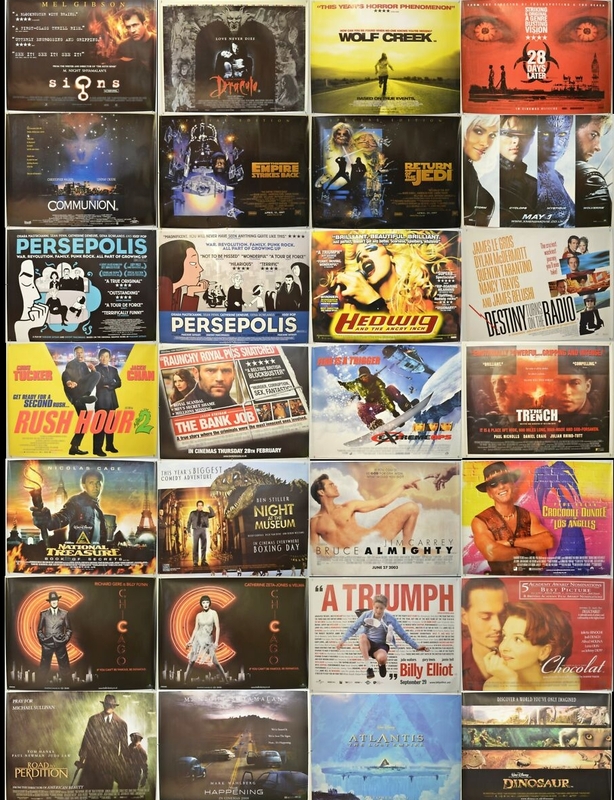 Action and Adventure posters such as THE BANK JOB and THE TRANSPORTER both starring Jason Statham, NATIONAL TREASURE : BOOK OF SECRETS, EXTREME OPS, BEHIND ENEMY LINES, and comedy adventures RUSH HOUR 2, NIGHT AT THE MUSEUM and CROCODILE DUNDEE IN LOS ANGELES. Along with many other titles. Auction ends Sunday 21st April 2019. 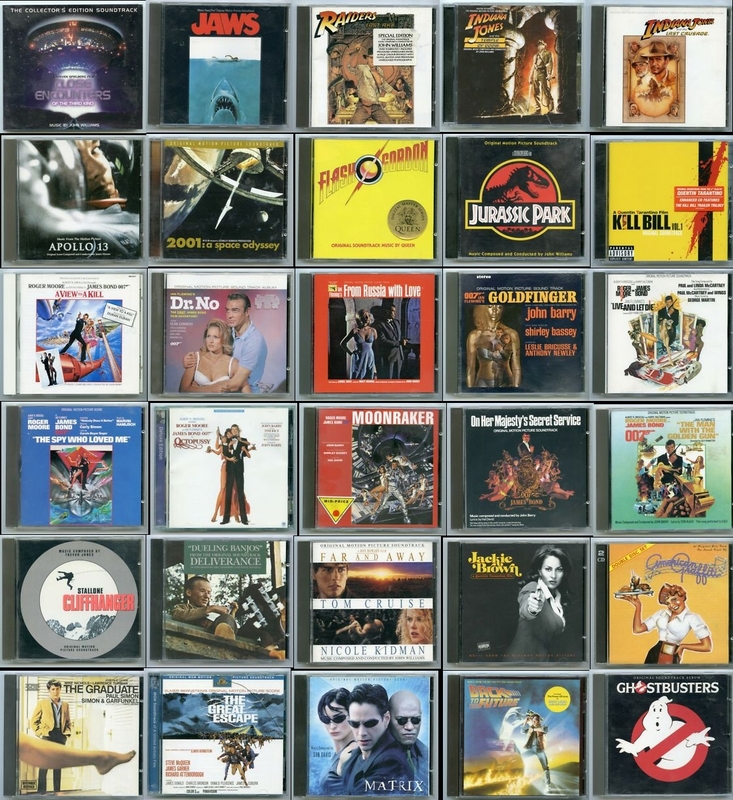 For this weeks auction I have something completely different for you, 136 Original CD Soundtracks from a great selection of movies by renowned composers. Starting with 21 James Bond Titles including DR. NO, FROM RUSSIA WITH LOVE, MOONRAKER, THUNDERBALL and YOU ONLY LIVE TWICE composed by the likes of John Barry, David Arnold and Marvin Hamlisch. 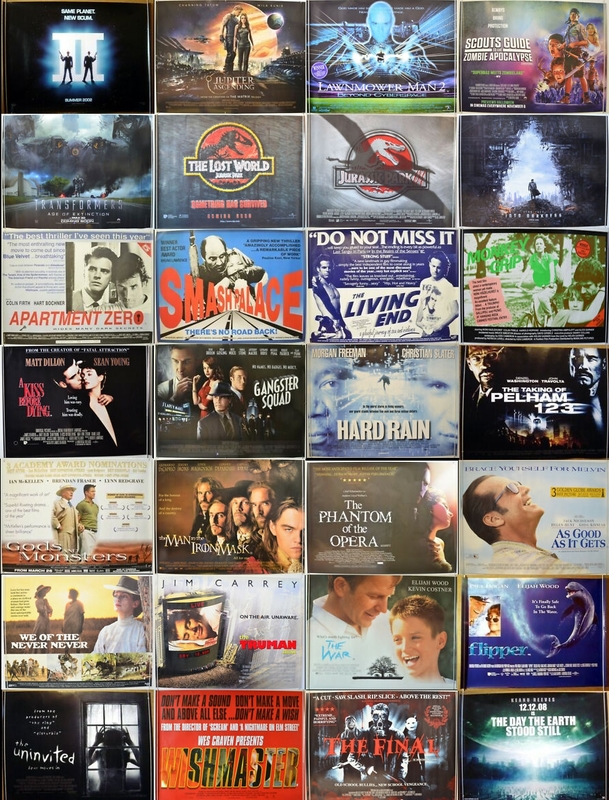 Probably the most famous and collected Film Composer is John Williams, and I have a large selection from his catalogue including E.T. THE EXTRA TERRESTRIAL, FAR AND AWAY, HOOK, RAIDERS OF THE LOST ARK and the INDIANA JONES series, plus JAWS, JURASSIC PARK, JFK and CLOSE ENCOUNTERS OF THE THIRD KIND. Other popular composers include James Horner (APOLLO 13, BRAVEHEART), Jerry Goldsmith (AIR FORCE ONE, BASIC INSTINCT, L.A. CONFIDENTIAL), Thomas Newman (MAD CITY, MEET JOE BLACK, HORSE WHISPERER), Hans Zimmer (THE DARK KNIGHT, GLADIATOR, BROKEN ARROW), Danny Elfman (MISSION IMPOSSIBLE, BATMAN, BATMAN RETURNS) and of course Alan Silvestri (BACK TO THE FUTURE). Auction ends Sunday 24th March 2019. This week I have a mixture of 1970's and 80's Original British Quad Posters and 1960's Lobby Card sets up for auction on eBay. War and Westerns posters include THE SEA WOLVES starring the likes of Gregory Peck and Roger Moore, Peck also stars in THE BOYS FROM BRAZIL, Also listed is Burt Lancaster in CASTLE KEEP, and from 1963 I have THE LEGION'S LAST PATROL. Fans of Tom Chantrell art will enjoy DEATH IN THE SUN featuring Christopher Lee.Other westerns include THERE WAS A CROOKED MAN, VENGEANCE and a double bill for GOOD TIME OUTLAWS / A WHALE OF A TALE. Popular 80's posters include ABOUT LAST NIGHT featuring some of the 80's Brat Pack Rob Lowe and Demi Moore, Tom Cruise stars alongside Paul Newman in THE COLOR OF MONEY, Clint Eastwood in ANY WHICH WAY YOU CAN, Plus 80's Sci-Fi Fantasy titles including ENEMY MINE, D.A.R.Y.L. , RETURN TO OZ and Terry Gilliam's THE ADVENTURES OF BARON MUNCHAUSEN. Other Quads include ROCKY II, A STAR IS BORN, SGT PEPPER'S LONELY HEARTS CLUB BAND, THANK GOD IT'S FRIDAY, THE AMAZING CAPTAIN NEMO and the 1966 re-release for THE TEN COMMANDMENTS. Lobby Card sets include ATTACK! (1956), DARING GAME (1968), GENTLE GIANT (1967), MY SIDE OF THE MOUNTAIN (1968), ONLY WHEN I LARF (1969), THE CAPER OF THE GOLDEN BULLS (1967), THE FOOL KILLER (1965), THE DESERTER (1971), BRAINSTORM (1983) and AIRPLANE II - THE SEQUEL (1982). Auction ends Sunday 17th March 2019. 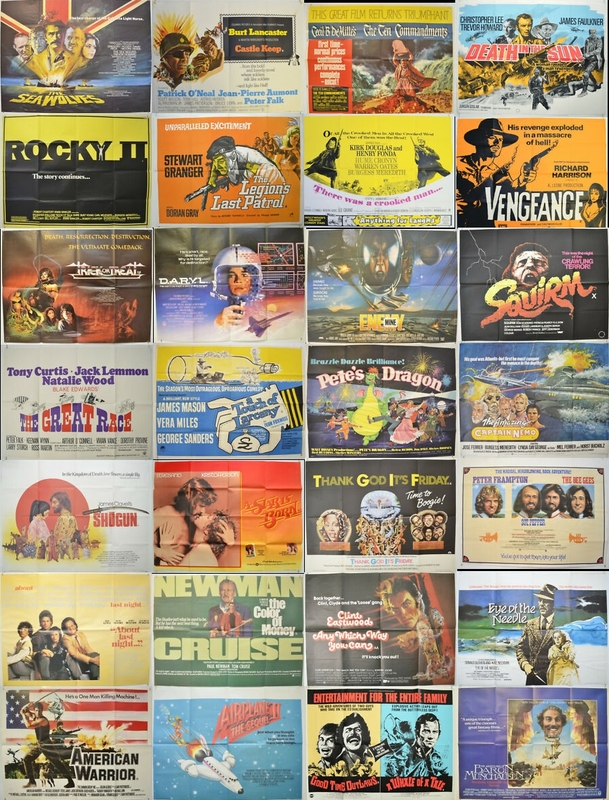 This week I have 60 Original British Quad Movie Posters up for auction on eBay, All with a starting price of just £10 including UK P&P! (Worldwide shipping is discounted accordingly). Titles include popular Sci-Fi features such as JURASSIC PARK II and III, LAWNMOWER MAN 2, STAR TREK INTO DARKNESS (Starfleet Insignia design), TRANSFORMERS: AGE OF EXTINCTION and the 2008 remake of THE DAY THE EARTH STOOD STILL starring Keanu Reeves. Action/ Thrillers include BANGKOK DANGEROUS, COLLATERAL DAMAGE starring Arnold Schwarzenegger, GANGSTER SQUAD featuring Ryan Gosling and Josh Brolin, HARD RAIN and RISING SUN starring Sean Connery and Wesley Snipes. Several Horror's are also listed including the comedy horror SCOUTS GUIDE TO THE ZOMBIE APOCALYPSE, plus wes Cravens WISHMASTER, THE UNINVITED and THE FINAL. Other titles include THE MAN IN THE IRON MASK, THE PHANTOM OF THE OPERA, THE TRUMAN SHOW and WE OF THE NEVER NEVER from 1983. Auction ends Sunday 10th March 2019. This week I have 300 Original British Quad Movie Posters up for auction on eBay, All with a starting price of just £9 including UK P&P! (Worldwide shipping is discounted). There are far too many to list here and all are from the 1980-2010s with a varied mixture of genres, So when you have a spare 10 minutes sit back with a cup of tea and browse through the listings at your leisure. Auction ends Sunday 03rd March 2019.